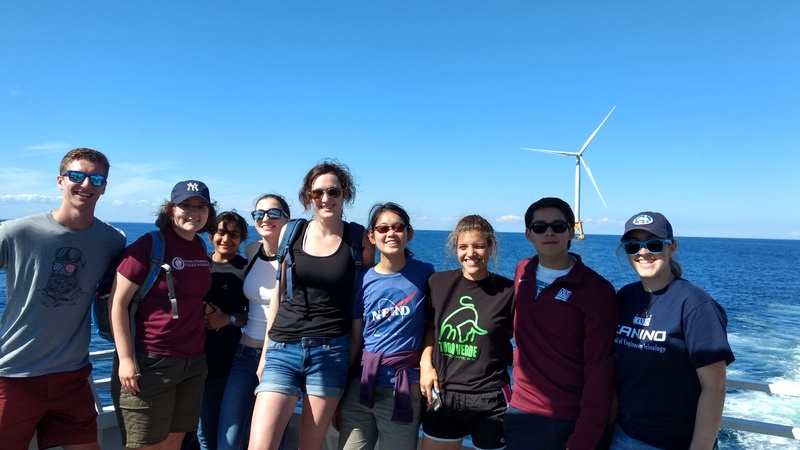 On July 26, 2017, the students in the summer REU (Research and Education for Undergraduates) program as well as 10 IGERT students plus Curt Griffin, ECO Department Chair and Jody Lally, IGERT Coordinator, went on a field trip to Rhode Island. The first stop was at the US fish and Wildlife Service Kettle Pond Visitors Center in Charlestown, RI, where we heard a presentation by Pam Loring, IGERT PHD, on bird tracking research. We then traveled to Port Judith, where we caught a ferry to Block Island. There we met with Bryan Wilson, Deepwater Wind's Block Island Offshore Wind Farm Manager, who talked with us about the history and development of the Wind Farm. We then took another boat out to the wind farm, where we were able to view each of the 5 wind turbines from the ocean below the turbine. The group's assessment of the project was unanimous – very impressive! And hopefully just the first of many more offshore wind farms to be built in coastal New England.